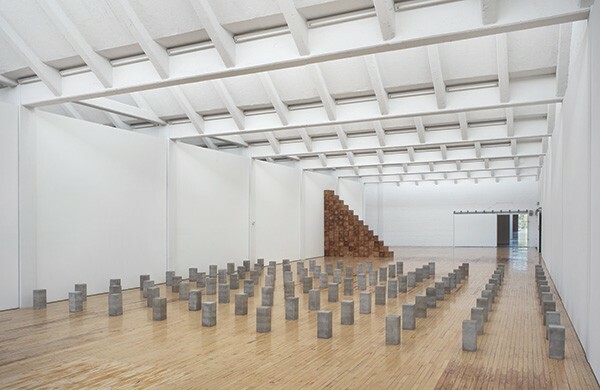 Installation view, “Carl Andre: Sculpture as Place, 1958–2010,” Dia:Beacon. Through March 2, 2015. 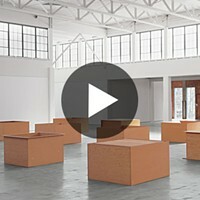 "This requires a long visit, it requires an engaged mind, and yes, it requires openness, as well," observes curator Yasmil Raymond of "Carl Andre: Sculpture as Place, 1958-2010," currently at Dia:Beacon. The first item in the show, Scatter Piece, consists of 33 ball bearings, 14 Plexiglass blocks, and other paraphernalia spread across the floor. A guard explained that the owner of the piece came to Dia and dropped all the items at once; they fell in a random pattern. The second work, Herm, is a length of cedar post resembling a pedestal for a sculpture. Andre can harness emotions with his minimalist gestures. For the inaugural show at PS 1, the exhibition space in Queens, Andre set up 100 identical concrete markers in the former playground. (The building had been a public school.) Titled Lament for the Children, this piece was a monument to the kids who would no longer play there. Walking through these markers at Dia, which resemble the gravestones at Arlington National Cemetery, I felt a tragic sadness. Each marker is 18 inches tall, the height of a newborn baby. After this installation is Triskaidek, 91 lengths of Western red cedar arranged into a staircase almost reaching the ceiling. "Triskaidekaphobia" means "fear of the number 13," and sure enough, counting the steps, I found 13. Is this a joke on a 12-step program? 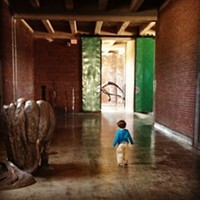 Whatever the intention, this mighty wooden stairway radiates hope, after the melancholy "Lament for the Children." Good work, Yasmil Raymond! The Uncarved Blocks is a collection of cedar posts arranged in groups of two, three, and four, evoking the skyline of a small city like Minneapolis. Its title is a reference to Lao Tzu, who writes of the "uncarved block" in the Tao Te Ching. An uncarved block is a paradox—how can a block exist if no one cuts it? Could wind or rain randomly create a pure cube? Andre's title suggests that today we see many uncarved blocks, lying in alleys or construction sites—cinderblocks, for example. No one carved them; they were spit out by a machine. We encounter the Taoist mystery of the uncarved block, and never notice. Carl Andre was born in Quincy, Massachusetts in 1935; his father worked in a shipyard. After receiving a scholarship to Phillips Academy, Andre served in the Army. He never attended college; instead Andre moved to New York City in 1956, joining a circle of artists including Frank Stella, Eva Hesse, and Hollis Frampton. 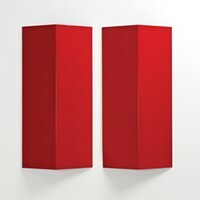 His first solo show at the Tibor de Nagy Gallery in 1965 was widely acclaimed. Andre is best known outside the art world for the mysterious death of his wife, the artist Ana Mendieta, in 1985. When she fell from the window of their apartment on the 34th floor of a Greenwich Village building, Andre was charged with second-degree murder. Three years later he was acquitted of all charges. Perhaps Andre's work is about absence. Herm is a pedestal for a nonexistent sculpture. Triskaidek is a stairway to the second floor of Dia, which doesn't exist. "Cask of Meats" is a hardcover book with a hole bored through it. Andre is in love with the invisible.